Hello folks, WeTrust team here coming at you with our first bi-weekly community update (once every 2 weeks). We know we’ve been a little slack lately with keeping you guys in the loop about what’s going on, and that’s mainly because we’ve had our heads down since the crowdsale, trying to work out our immediate direction and find some more great people to help us realize that. We’ve taken on board the feedback about providing regular updates, so hopefully this format will be nice and digestible for you all. We’ll try to keep it brief but to the point. We’re hiring a Product Manager, Software Engineers, and an Office Manager. If you can refer anyone for these positions (and they go on to work for WeTrust for 180 days or more), you’re up for a whopping USD $5000 referral bonus. We’ve been interviewing many talented folks and need your support to refer the best to join us on our mission! We are currently running a 99designs competition, with a first prize of USD $2799. If you think you can design the best homepage for WeTrust’s website, make sure you get your entries in. Once the design competition closes, we’ll setup a poll and ask YOU for your opinion on the best design and layout that best represents WeTrust. We’ve had further discussions with Rafa from AhorroLibre and discussing ‘Financial Inclusion Grants’, and are nearing an agreement to help drive Tanda (ROSCA) popularity in Tijuana, Mexico. Details of the collaboration are to be determined shortly, and we’ll make sure to put that up in a separate blog post. I’ve been helping Hoang out with the phone screening and onsite interviews for potential new Front End Developers, Product Managers, Full Stack Engineers, UI/UX Developers and Office Managers. I also checked out some larger offices in Palo Alto and Mountain View, the one we’re in currently is a sublet, and can get pretty loud at unexpected times. It’s also a little cramped, and since we’re scaling the team it would be great to have somewhere that we all fit into without touching elbows. I’ve mapped out a lot of the CoinPool product ideas, and been brainstorming company culture improvements, so that the new old folks feel as comfortable as can be. I’ve been through over a hundred resumes, whittling them down to a few phone screenings and ultimately on-site interviews. Additionally I’ve worked on new designs for the main website, relaying feedback and translating it into pixels. I have also begun work on another two WeTrust projects, CoinPool and Catalyst, we’re not saying too much about these just yet but keep your eyes and ears peeled. I’ve been researching and developing (with my colleagues) a new trading product named ‘Delateral’. Currently we are thoroughly investigating the legal aspects of such a product and looking for an approach that will cooperate WeTrust’s financial inclusion approach whilst abiding by the current regulations. I’ve been very involved in market research for the platform, as well as pulling together the whitepaper, which is almost ready. The past couple of days I’ve been working on content for the new website. The goal is to communicate clearly and effectively what WeTrust stands for, what our products do, and what we envision for our future as a company. I’ve also been working on a product survey that we’ll be sending out to our community soon, to give us a sense of how to focus certain features of our product. I’ve been working closely with Cooper, our UI/UX contractor to build out the frontend for our revamped TLC (ROSCA) product. It should be complete within a week. We’ll then work on implementing the rest of backend logic and getting everything plugged in and tested. I’ve also been exploring options to use ETH addresses to securely login instead of traditional methods (similar to the way https://dapp.lemon.email does it), this way it should save a little effort (you won’t have to type in username/password every time) and it should be a lot more secure, since we’re using message signing to login. The past couple of weeks I have been working with Mivsam on Delateral. Again unfortunately we can’t say too much more about what it is (thanks, lawyers), as we’re still in the middle of getting legal and regulatory counsel about any public description of the product (and indeed creating it at all). We have a whitepaper pretty much ready to go, and we’ve done some minor initial development. Hopefully our continued chats with lawyers will be fruitful and we can release some more details in the near future. I’ve been leading the delateral product development, with my very skilled teammates Brian and Mivsam. As they mentioned, we unfortunately cannot shed too much light on the product yet, but we’re doing a thorough analysis of the market needs (including analysing every single ETH transfer ever) and the regulators, as well as the technical feasibility of the product. Initial results look promising! I’ve mainly been working on the website revamp, incorporating feedback from the community. I’m done brainstorming for Catalyst and have created some wireframes, soon I’ll begin to flesh those out and add some colour to ensure they’re on-brand. We know there have been a lot of teams in the crypto community hit by Slack scammers, people are abusing the Slackbot reminder service to send out phishing messages to other users. We’re sorry this is still taking place, Slack’s response has basically been that we shouldn’t be using it for non-trusted communication. We have looked at a couple of other chatroom-style options for community engagement, but for now we have decided to stick with Slack since it’s where most of our community already hang out, and we’re hoping that most people are getting wise to the scams going round. That being said, if things get worse and we decide that we need more admin control over the chat environment, we’ll reevaluate a move to another platform and let you know in the next update. Please continue to report scammers to the team in slack, either @blorange or @damo are your best bets for a quick response. Well would you look at that, another fortnight goes by like a cool summer breeze. Here’s the update as promised, including a couple of conferences and a new addition to the roster. We’ll also try to reduce any overlap between our personal updates by switching to updates for each product specifically where possible. WeTrust participated at NCC2017 in Tokyo organized by MIT Media Lab and Digital Garage, where we led a discussion on the impact of social lending, and explored the possibilities for improving financial inclusion via blockchain tech. WeTrust also established some connections with projects with whom we have potential to collaborate with in the future. We’ve been doing a ton of phone screens and onsite interviews these past two weeks. We’ve advanced a number of candidates on both the technical and non-technical areas to the final rounds and are close to closing on a few of them. We’re hoping to beef up our team with new developers and business side support soon (e.g. marketing, administration, event planning) so we can accelerate our development. We plan on moving to a new office in Downtown Sunnyvale — pending some paperwork and logistics. We’re hoping we can move in within the next couple of weeks. This is really exciting since we will be close to public transportation, which is critical for attracting top talent across the bay area from SF thru San Jose. As Community Manager one of my near term priorities is exploring alternatives to Slack. The top two contenders are Telegram and Discord. Would love to hear the pros and cons of what other communities have tried. It has also come to our attention that our bitcointalk thread and Reddit need some love so I’ll be getting over there over the coming days and weeks. Slack (or its replacement) will likely remain the best place to drop in and get info. Come on over! wetrust.io/slack-invite. Ifwe move to a Slack alternative, we’ll besure to let you know! I also had the opportunity to attend my first blockchain conference (w00t!). The Blockstack Summit had an amazing lineup of speakers and panelists, a diverse, energetic community, a righteous cause and an infectious buzz in the room. We learned some thangs and made some sweet sweet contacts. My hats off the Ryan and Muneeb from Blockstack for a wonderful event! Sadly there’s very little to say about Delateral this week, but we have halted our work on implementing the product for at least the next couple months. Currently the resources are more efficiently spent building the Trusted Lending Circles dapp. We have been working with 99designers to re-design WeTrust’s main website and we would love to hear your feedback. Please cast your vote and write your reviews herehttps://99designs.com/contests/poll/qnlkrk. Furthermore, we are working on the User Management Service so that your WeTrust crowdsale accounts will be integrated with future products seamlessly. We have been working on finishing up the one-(and-a-bit)-click signup flow using message signing, which is now really smooth. It’s our first time using GraphQL and React with Redux, so we’re learning the ropes as we go, taking things slowly and trying to ensure we have a solid review process and development cycle. The next thing we’ll be working on is plugging in the happy flow of creating the Lending Circles. We will likely be a lot more efficient once we have some experience working with the various parts of the state management, but for now we’re just making sure we follow best practices and get it right. Luckily we have Hoang on hand to help us out when we’re in a state. I’ll show myself out. Leave us comments here or on our slack channel! It seems like these days, the only constant in the blockchain space is how quickly things change: SegWit, fluctuations in the cryptocurrency market, and plenty of projects with great potential completing successful crowdsales. Like the rest of the blockchain world, WeTrust has been going through some exciting changes that we’d like to share with our dedicated community. Yutai is a seasoned UI/UX designer and researcher who is passionate about leveraging analytics data to create the best possible product. His prior experience includes serving as Director of Product Design and User Experience at online payments platform PayWithMyBank, Director of User Experience at online advertising platform AdBrite, and as a co-founder of civic engagement website CrowdCampaign. In addition to his professional work, Yutai is the creative mastermind behind Rental Car Rally. Yutai holds a Bachelor’s Degree in Mathematics from Queen’s College. With Yutai on our team, WeTrust community members can look forward to more intuitive, easy to use product releases. Hailey is an incredibly talented graphic designer who has a passion for combining art and technology to beautify and improve quality of life. She previously served as Head of Product Design at Munchee, a visual food review and social networking app for food lovers. Hailey holds a BA in Graphic Design and User Experience from Columbia College in Chicago. We look forward to gracing WeTrust’s products and website with her beautiful designs. Our latest hires will soon be joined by new Front End Engineers. We have some candidates who are at the offer stage, but we could use some help filling a few final positions. We are actively seeking referrals for these positions, and are offering a Recruiting Bonus of $5,000 (to be paid in TrustCoin) to any member of our community who makes a successful referral. Help us grow our team so that we can bring financial inclusion to the blockchain! With all of these new hires and to improve our ability to attract folks who prefer to live in SF, we have been looking for an office space within walking distance to the CalTrain line. Given how congested Silicon Valley traffic is these days and the competitive market to attract talent, it is important to be close to public transportation. In addition to our new hires, WeTrust is honored to have a new advisor to help us achieve our goals. 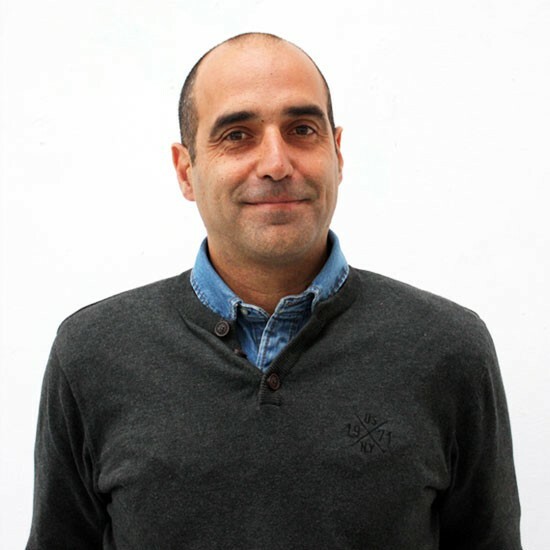 Jean Claude Rodriguez-Ferrera, the co-founder of peer-to-peer ROSCA app Puddle, has agreed to join us as an advisor. In addition to his work on Puddle, Jean Claude also serves as a Fellow at the Ashoka Foundation, where he works on creating self-sustaining, immigrant-led financial groups. We welcome his knowledge and connections in the Social Lending space. Feature roadmap and roll out strategy for our Trusted Lending Circles. At the moment, our team is hard at work creating the ideal end to end flow for users of our app. Once this “happy flow” is ready, we will add code to handle special circumstances which require additional validation and error handling. At the same time, we are integrating with uPort to make the process of logging into our ROSCA app as simple as possible. We’ve also set up an environment with testrpc, mongoDb, other app components, and the creation of mock data to allow us to test the app going forward. We are in the process of creating a framework that helps connect startups, academics, and enterprises to support research that benefit our mission. We are designing a process where grants can be provided for innovative projects that seek to improve financial inclusion. Projects dealing with financial technology, developmental economics, financial literacy and education, sociological issues in financial inclusion, and promoting awareness of lack of access will all be considered. Projects not directly dealing with financial inclusion, but which provide enabling technologies for the WeTrust mission, will also be given consideration. Please contact [email protected] if you have proposals for research and projects that you believe we should be working with to improve financial inclusion. Our community is an incredibly valuable part of our product development process. Given our community members’ deep knowledge of blockchain and passion for improving access to financing, any feedback you provide is greatly appreciated. We strive to take your input into account when considering future iterations of our products. That’s why we’d like to ask for your help in completing a quick 9 question survey regarding your participation in prior token crowdsales. In addition to helping us understand the market for future products, the results of the survey will be published in a future blog post. Before we go, we just wanted to mention once again that WeTrust is looking for rockstar Front End Engineers. We’re offering a $5,000 bonus (to be paid in TrustCoins) for any referrals that we hire. Help us build our team of Blockchain Ninjas! Team WeTrust, reporting in with another Community Update. We’ve spent much of the last two weeks hashing out details of our ROSCA product, so much so that we’re including a Technical Deep Dive (details below) to keep you abreast of these changes. At this point, we have hit a feature freeze on our TLC product, and have started in-depth testing of it. Testing will continue in the coming weeks as we deploy our code on a staging server and start investigating the app flow and additional UI changes, leading up to our product launch. We’ve continued to work on our website revamp, and appreciate everyone’s patience while we work out some final details before we release it. In addition, we have begun creating a KnowledgeBase and Help Center that will help our customers, both individuals and organizations, understand how to best use our products. At a managerial level, we have decided on an aggressive milestones roadmap that charts our deliverables through the end of the year. Take a look at our updated Product Milestones below. We’ll be striving to hit each of the goals laid out in the roadmap, culminating in delivering a Trusted Lending Circles product this December. In our last update, we described a new “ROSCA for one” product that would encourage people to save and help them build credit in the meantime. Internally, we have taken to calling this product the “Piggy Bank” (though unlike the piggy banks we used to save our coins as kids, this piggy bank can help improve a person’s credit score). We have created a mock-up of this product and have been performing user testing with students at a local community college. Our Engineering team has been making great progress on creating a more robust Trusted Lending Circle platform. Those of you who have seen our previous technical deep dives know that the unique architecture of the WeTrust platform means we make two calls when the user interacts with the TLC Smart Contract: one to the backend server for static data, and one to the Smart Contract (via MetaMask) for dynamic data. As we made progress towards completing the happy flow, we encountered an issue with dealing with data from two different sources. We are creating a cleaner layer for doing this that will make our code more robust and make it easier for us to add new features in the future. We’ve also explored uPort integration, and were able to let users log in using the uPort app installed on the user’s smart phones. As we have our own server, we will need to implement the authentication on the backend to protect our users’ privacy. Given uPort is still in alpha, we won’t be releasing this feature on the mainnet anytime soon, but we may introduce it on testnet when it is more stable. In addition, we’ve heard from talented techies on our Slack that have great ideas on how to code improvements to our product, particularly on the React.js and server side. We are creating a development environment in Docker to let people test out their new code, and creating guidelines and readmes to make it easier for contributors to get started. This is a first step towards our goal of making WeTrust open source. We want to remind everyone that WeTrust is looking for Front End Engineers to join our team and build products that reduce financial complexity and increase inclusion. The job description is here, and as a reminder, any successful referrals sent our way will earn a $10,000 bounty (to be paid in TrustCoins) and a huge debt of gratitude (and trust, of course) from all of us. The weather’s getting a bit cooler, the leaves are starting to change color, and WeTrust is one step closer to releasing our Trusted Lending Circle product. We’re happy to announce that our new website is up and ready, take a look at it here. In the rest of this update, we’ll be talking with a new hire who’s leading an overseas team, and update you on the progress of the technical team and some new UX features that we are adding. Let’s get started! With Khanh joining our team, we now have a presence in Saigon. This will allow us to take advantage of the stellar software talent in Vietnam, in addition to having employees residing in a community that has a long history of using Trusted Lending Circles. We interviewed Khanh to learn more about his background, what his team will be working on, and the potential of blockchain based Trusted Lending Circles in Vietnam. Hi Khanh, could you tell us a bit about your background? I was born and grew up in Vietnam, a small country in Southeast Asia. I’ve been fascinated by economics and the finance world since high school (after reading the Freakonomics series of books) and once planned on pursuing economics as a major in college. My parents encouraged me to study abroad and see the world, and California seemed like a great destination for me at the time: I heard there was nice weather and good schools. During my first year of college, I discovered a passion for building things, particularly web programming. I realized with programming, I could contribute something valuable which would potentially be used by thousands of people. This feeling changed me and I ended up graduating from University of California, Berkeley with a degree in Electrical Engineering and Computer Science. During college, I obtained enormous experience in programming, from school projects, hackathons, internships, and even research with professors. I treasured every opportunity to learn to build products and work with a great team. After college, the thought of having a corporate job did not appeal to me. The job security was not that interesting, and I wanted to see more of the world. I decided to come back to Vietnam, the Third World country that I had grown up in. I did some traveling and ended up working in a rural factory manufacturing kitchen cabinets. I studied the art of carpentry, from choosing materials to producing crafted products. I also leveraged my technical skills to improve the processes used in the factory. It was exciting to learn new things, to push myself through sweat and tears to make good products. This job helped me realize how the world works, how Third World factory workers are working for much less pay, how manufacturing jobs are being outsourced to Vietnam, and how the carpenters making the kitchen cabinets never actually got to see how their products were used. I also participated in helping the owner do some sales and marketing overseas. This job really taught me how to have an entrepreneurial mindset. After half a year, I got back into the software industry. I hope to continue building products that will be touched by thousands of people, and show that software is really “eating the world”. I did some freelancing, worked on some outsourcing jobs, and contributed to open-source projects. I also co-founded a website that helps local Vietnamese search for clinics, with reviews and ratings (like a Yelp for clinics in Vietnam). I did this until I truly became a startup engineer at a small startup called SalesHood Inc. It was a Software-as-a-Service sales training platform for sales professional founded by a Salesforce ex-executive and a serial entrepreneur CTO. I joined the engineering team at the early stage. I learned the difficulties in running and executing plans in a startup, in constantly satisfying customer needs, building a strong engineering culture, recruiting and mentoring colleagues, and making pragmatic tradeoffs between different engineering approaches. I was fortunate to work closely and be mentored by the CTO. After the company reached a level of scale when the engineering team had more than 20 people (after we secured series A funding), I thought it was time for me to look for a different challenge. I wanted to go somewhere that make impactful products (ideally consumer facing products) and that would push my growth even further. What aspects of the Trusted Lending Circle will you and your team be focused on? We’ll be working on building and launching the TLC product to the community. Specifically, we’ll be building web components, ensuring product stability and performance, setting up a scalable server infrastructure, and strengthening engineering processes for reliable delivery coupled with a high quality coding standard. What made you interested in WeTrust? What aspects of the product are you most excited by? I’m excited about working on consumer products, given that my background so far has mostly involved customer-centric enterprise products. I’m also excited by the idea of helping unbanked people around the world. Finally, I’m excited about working with this great team. I knew Hoang at UC Berkeley. We often did all-nighter projects together and it’s always been a pleasure to work with him. Have you or anyone you know had personal experience with Trusted Lending Circles / ROSCAs? I do not have personal experience with ROSCAs but I’m very familiar with the concept. The ROSCA model is very common in Vietnam. A group of individuals agree to contribute in order to save and borrow from each other. This happens often in offline settings where a group of people trust each other. I have seen my friends pay off debts and finance businesses using ROSCAs. However, this offline model requires tremendous amount of trust among participants. These issues around trust are what I think the WeTrust Trusted Lending Circle platform can resolve. What’s the status of Blockchain interest and adoption in Vietnam these days? Blockchain is relatively new in Vietnam. There are local meetups and workshops held by fintech organizations to promote it around here. And there are outsourcing blockchain developers doing jobs for foreign markets like Japan. Because of the talent scarcity, Vietnam is becoming a hub of talent adoption in recent years for many worldwide startups. We continue to make great progress on the Trusted Lending Circle, and are on track to deliver our product by the end of the year. At this time, we have issued a feature freeze on the TLC codebase, and any additional changes that we make will be to fix bugs. The last feature we added was a change to where data is stored in our framework that makes our product more scalable and accessible. Hoang is working on deploying the code to a staging server so that we can find and resolve as many bugs as possible. Speaking of bugs, we also have a Jira system up and running for tracking and resolving those pesky critters, in order to deliver a product that everyone can use with confidence. In parallel, Yutai is working on UX features that make it easy for our users to keep track of the accounting of their ROSCA. Given that the auction mechanisms of some TLC’s will involve keeping track of monthly contributions, fees, and rollover funds from previous contribution rounds, we feel it’s very important to have a simple and clear way of presenting this information to users. At this point, we have met ALMOST all of our hiring needs, but are always in the market for top talent, and open to adding one more Front End Engineer. The job description is here, and as a reminder, any successful referrals sent our way will earn a $10,000 bounty (to be paid in TrustCoins) and a huge debt of gratitude (and trust, of course) from all of us. Greetings WeTrust fam, it’s time for another Community Update. We’ve made some great progress on the Trusted Lending Circle app, and the Alpha build is now complete! At this point, the product supports all 3 ROSCA formats: Random Flow, Predetermined Flow, and the Bidding Flow. Our work this week has focused on restructuring the way new participants are invited to join a Trusted Lending Circle, a very important part of the process that we want to make sure we get right. At the same time, the team is hard at work testing the Alpha build. We finished our third Team Testing session this week, and are finding and resolving many bugs. Recently, Mivsam attended the 10th anniversary gala of our non-profit partner, Qualitas of Life in New York and made some exciting progress on our partnership. She met many people, ranging from business people to Federal reserve officers, all following and interested in the blockchain movement and eager to see where WeTrust’s product could be used to benefit immigrants to the US. These efforts with Qualitas are just the start of our ramped up promotional plans as we refine and execute our go-to market strategy, follow our blog to find out what we do next! In addition, Leon and Damo attended the Crypto-Consciousness Conference in San Francisco. It was a great chance to network with some like-minded people who believe in the power of blockchain, and Damo took the opportunity to meet in person with the rest of the team. Take a look at Damo with the robot Sophia, who made an appearance at the conference! Finally, as our product moves ever closer to a beta launch, we are hiring more people to help us usher our Trusted Lending Circles into the communities they can benefit. To that end, we are hiring a Director of Operations and a Business Operations Strategist, please send any referrals for these positions to [email protected]. At this point, between our teams in the Bay Area and in Vietnam, we have filled our needs for new developers, but we’re always on the lookout for talented techies who want to join our team also, please send referrals our way! As always, we truly appreciate any referrals we get from our wonderful community. Time for a special Testnet Launch edition of the WeTrust Update! We’ve just finished pushing our latest code to the beta server and we’re eager to have a large sample audience testing the product which we’ve all worked so hard on. Our whitelist testing has been going extremely well, with most of the feedback targeting small issues which we’ve been able to fix. Our latest product updates have included adding LogDNA for streaming our log files, NewRelics for performance monitoring, and Healthcheck for monitoring our cron jobs for batch processing. It’s all part of our efforts to ensure that our Trusted Lending Circles run as smoothly as possible right at launch. We’d like to thank all of our community members in advance for helping us beta test the Trusted Lending Circles product. Honestly, we couldn’t do this without you. We sincerely appreciate your hard work. Finally, as we continue to grow our team, we’re excited to present yet another interview with one of our new team members. This week, we speak to Jay Kim, WeTrust’s Senior Software Engineer. Hi Jay, could you tell us a bit about your background? I have a BS in Computer Science from Chungnam National University in South Korea and worked as the manager of a computing center at a small community college for about two years before I came to the US. In the US, I worked for a small startup, Equilar Inc, which did compensation data analysis. I worked as a tech lead and then later as a software architect for them. While at Equilar, I worked on pretty much everything involving the company’s products and engineering, such as building desktop applications for internal analysis tools, building enterprise web applications for customer facing products, and doing some database/system/network admin. Then I worked for Xsigo Systems, a company that specializes in virtual I/O systems for network and storage. Xsigo was later acquired by Oracle. I worked there a little over one year as a server-side Java engineer, focusing on their virtual I/O management web app. Then I moved on to Sumo Logic, a log management system company. I worked there for about two and a half years, as a front-end / UI developer working on building the UI for their log management system, including the search page, dashboards, and data visualisation. Then I spent time at Exabeam, a security platform company, providing apps for user behavior analytics, log management, and security incident management systems. I worked there for about four years, building multiple single page apps. And then, I joined WeTrust. Could you tell us about a particularly interesting project you’ve worked on? At Exabeam, I was the first front end / UI engineer, so when I joined there were no products or web apps.I built their first web app product from scratch. Later on, I built another web app from scratch again. Building apps from scratch was challenging, as I had to figure out everything that’s involved, but in the end, it was very rewarding since I learned a lot and was able to see the product work well (and sell) well. How did you first learn about blockchain? What excited you most about it? I actually didn’t know anything about blockchain until I interviewed with WeTrust. As I learned more about it, I’ve been feeling that there are a ton of opportunities to build products and tools on top of the blockchain. How did you first learn about WeTrust? What made you want to join the company? I learned about WeTrust from a recruiter. The main thing that convinced me to join the company was my first phone interview with George. I felt very special to get the first phone call directly from the CEO of the company. In addition, I liked the idea of helping poor people around the world, using one of the coolest technologies, blockchain. I like going fishing, along with watching Korean movies and TV shows. Thanks for chatting with us Jay! And as always, thanks to our incredibly supportive community. If you haven’t yet, head to https://tlc-testnet.wetrust.io/ and help us create a more financially-inclusive future! Have any feedback on the product? Messages of support? Tweet us at @WeTrustProduct! We are honored to be selected as one of the projects in the monthly community coin contest on Binance. for being a member of our community and supporting us along the way! Greetings and a very Happy New Year to our amazing, supportive community of financial inclusion devotees, Slack pundits, and die-hard HODLers. This year, I’m resolving to participate in more Trusted Lending Circles — and to make all my payments on time! Speaking of YouTube, we truly appreciate everyone’s comments on our first product launch ad, and are in the process of adding a better soundtrack to it. For those of you who missed the ad in our last update, check it out below! We also engaged recently with Black Crypto Investing, a large cryptocurrency group. Many of Black Crypto Investing’s members have personal experience with ROSCAs, and we appreciate their insight into our product and the direction of our company. Check out George’s chat with them here. As WeTrust starts the New Year, we are looking forward to working hand-in-hand with our community to refine and improve our Trusted Lending Circle product as well as building new products that serve to promote financial inclusiveness. 2017 was an incredibly exciting year of growth, learning, and accomplishments for all of us, and we’re confident that we’ll see more of the same in 2018! Here at WeTrust, we sincerely appreciate all of the support we’ve received from our amazing community. That’s why we wanted you to be among the first to know about our partnership with Bee Token, a leading blockchain startup offering a decentralized home sharing network (think “Airbnb on the blockchain”). Bee Token will be using WeTrust’s insurance platform to cover property and furniture damage incurred by hosts on their platform. We’re excited about the opportunity to work with Bee Token, a leader in the blockchain home sharing space that has nearly 100k participants whitelisted for their upcoming crowdsale and over 50k active participants in their Telegram group. This collaboration is the first of many that we believe will demonstrate the advantages of the WeTrust platform in providing decentralized insurance and insurance-like products. Thanks again for the support, feedback, and ideas. We look forward to sharing more of our progress with you as we build towards a more financially-inclusive future! Read press coverage of the partnership here. We founded WeTrust to demonstrate how innovative blockchain technology could be combined with time-tested economic traditions to improve financial inclusion. In pursuit of our mission, our first year of product development efforts culminated in the release of Trusted Lending Circles (“TLC”), one of the first decentralized applications that allows users to collaboratively save money with their peers, on Ethereum Mainnet. As a team, we believe that releasing this dApp is only the first step in our mission to promote financial inclusion. While we were building our TLC dApp, we noticed a lack of tools and infrastructure available to help support the development of dApps. Given what we’ve learned, we saw opportunities to help the industry accelerate while improving the dApp development ecosystem. Many individual developers and startups moving into financial dApp development will face the same challenges we encountered when building the TLC dApp, such as the need for rapid node deployment and specialized testing tools, or the inefficiencies of slow speed, high cost transactions. So as we’re working on building product enhancements and fixing bug reports on the TLC, we’re also starting the development of a platform that will enable financial dApps to be more rapidly developed, tested, and deployed, while taking advantage of faster speed, lower cost transactions. We want to make it easier for ourselves, and eventually others, to create industry-changing financial dApps, ensure proper functionality, and test in a wide range of scenarios. 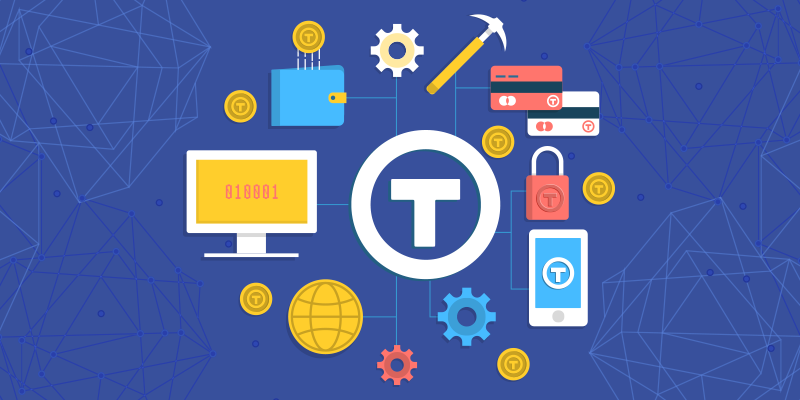 In addition, we recognize the need any financial dApp developer has for timely and cost efficient transactions which will be possible on the TRST powered sidechain currently being designed. Ultimately, we hope to drastically reduce the friction in financial dApp development and drive innovation that supports our mission of promoting financial inclusion. In parallel, we are continuing our targeted user testing and acquisition efforts for Trusted Lending Circles, our flagship dApp, which will eventually operate on the future TRST sidechain and benefit from faster, cheaper transaction processing. The feedback we’re gaining from our user testing will be used to prioritize our next set of TLC feature releases scheduled for Q3. If you know an organization that would be interested in using TLCs, please get in touch and let us know! The future is yet uncertain, and the best laid plans made by startups often change — even more so in our rapidly evolving blockchain ecosystem. Despite the unknowns ahead of us, we have charted out a tentative roadmap. We share this with some hesitation, so I must caution that one must view this with the understanding that the probability of changes increases for those milestones further on the horizon. However, as Julian from Golem points out in one of his blog posts, despite the challenges and unknowns that we will face and solve, we do need a roadmap and timeline. This is our guide as a company, but a guide that must evolve with business needs, not a prescription set in stone. As technologists and startup entrepreneurs, we must launch, iterate, and adjust as needed, based on the latest information, without holding too tightly to even the best designed plans. In Q2, you can look forward to our TLC dApp rebranding that will happen alongside our targeted user testing and acquisition campaigns — more on that in the coming weeks. You’ll be able to start a TLC with your friends via mobile dApp browsers, and we’ll start testing various versions of the TLC using our new internal testing tools. We will also be conducting pilots for node creation/ deletion tools soon, and if you’d like to test out these features, please sign up here. Although these were intended initially for internal use, we may make them available for the public depending on interest. 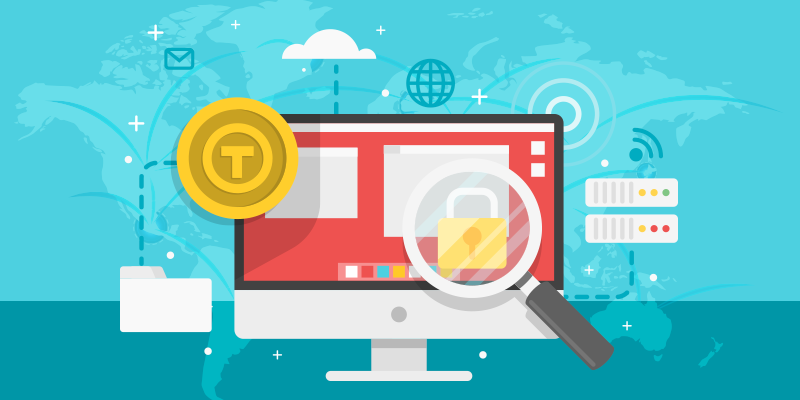 In Q3, our data-driven analysis of user feedback will have helped determine the new set of features to be built and released for the TLC, and we plan to incorporate the use of TRST tokens as access to some of these new features. In addition, a key outcome of the inception event we held as a team in February 2018, was that we need to build our own sidechain to improve usability of our own TLC and financial dApps like it. 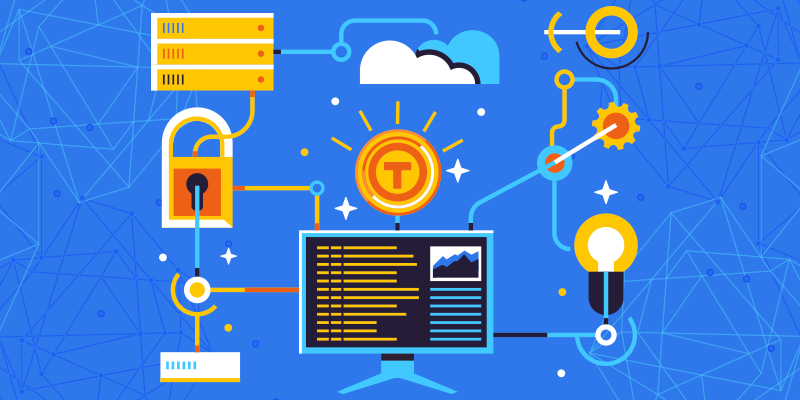 As a result, we have embarked on the design of what we’re calling internally “TRST Chain.” This will be a TRST token powered sidechain which we believe will benefit our users in terms of capabilities, cost, and speed for financial dApps. We are in the early phases of design and will have more to share in the coming months regarding the it’s capabilities and the product vision. In Q4, after significant testing, we expect the TLC to be migrated to the TRST sidechain testnet, in order to optimize transaction speed and cost. Interchain nodes should be in place to connect the TRST sidechain with the Ethereum Mainnet, and we’ll also be building various end user tools such as native TRST wallets and node clients. By Q1 2019, we envision the TRST sidechain will be live on Mainnet along with various financial dApp modules and plugins to make dApp development more developer friendly, and ultimately enable the proliferation of consumer facing financial dApps. The road ahead can never be guaranteed, and there will be adjustments along the way. However, our mission remains to build products that improve financial inclusion — whether directly or indirectly. We’re excited to undertake this ambitious phase in our project, providing a boost to the entire ecosystem and addressing known issues in building financial dApps, which we are well-positioned to do. By leveraging the experience we’ve gained in building the TLC, we’re able to share what works for the benefit of the entire community of dApp developers and contribute to tomorrow’s blockchain infrastructure. Thanks for sticking with us on this journey, and we’re looking forward to keeping you up to date on our blog and answering questions in our monthly AMAs on Telegram. Stay in touch, and see you on our social media channels! In light of the recent delisting of TRST from Bittrex, we thought it would be useful to share additional context about WeTrust in the broader cryptocurrency regulatory framework. While WeTrust was offered as a utility token in early 2017 and has always sought to conduct itself accordingly, we are aware that certain U.S. regulators have more recently indicated that they view nearly every ICO token as actually a security. Given these regulator comments, it is our understanding that actively seeking to list our token on exchanges, or to maintain listings, particularly on U.S. exchanges, is potentially inconsistent with being a utility token since regulators view exchanges as being mechanisms to support the speculative price of tokens, and therefore an indication that the tokens were not issued for their utility on a particular technology platform. After careful analysis and consideration, we determined there would be undue regulatory risk if we were to take action in order to maintain the listing on Bittrex. We look forward to greater regulatory certainty on this important topic so that companies like WeTrust, those that are making genuine efforts to be compliant, are not disadvantaged. We believe the long term success of our token and project requires taking a long term view on regulatory matters. We have actively sought greater clarity on the legal status of ICO tokens given the regulatory guidance that was issued after our token offering was completed in early 2017, and we are engaged in ongoing efforts to be proactive about the regulatory and legal compliance issues that all companies in our space are facing. Our commitment to do the right thing by adhering to all laws and regulations continues, and as a result we cannot take steps that would undercut our compliance efforts to follow the direction of regulatory guidance, even if that means exchange delisting in certain cases. The cryptocurrency space is quickly growing and evolving, and we believe that increased regulatory certainty will be of great benefit to the projects and tokenholders in our ecosystem. WeTrust will continue to stand for its mission of promoting decentralized financial inclusion and social impact through its products, both currently available and in development. We knew undertaking this project would be a journey and we are grateful to share it with you. We intend to share more as information becomes available, so please stay tuned for our regular updates and AMAs. Our mission from the very beginning of WeTrust has been fostering financial inclusion. We envision a world in which everyone has equal access to financial tools to improve their lives. That’s why we created our first product, Trusted Lending Circles, a ROSCA-inspired decentralized app for collaborative savings on the blockchain. In working to reach customers who need this product, we recognized an opportunity to support the nonprofit organizations and charities that are already serving the underbanked communities that our products were designed to help. Partnering with nonprofits that align with our vision of financial inclusion, we theorized, could bring us greater scale in helping these communities. Naturally, we wanted to test our theory, so we designed a survey of charitable giving habits to learn more about how we could help align crypto donors and nonprofits. We received about 150 responses in just a few days and were pleasantly surprised by how many survey respondents said they would be willing to engage with us on further follow ups. Confirming our product hunch, we found that the overwhelming majority of respondents do want to contribute cryptocurrency to their favorite charitable causes but have few opportunities to do so. The results also showed us which causes our community is most interested in supporting and the distribution of how much the community contributed to charitable causes in the past year. Another thing is for certain: our community is a generous group, with the majority having donated between $100 to $10,000 in the past year. Since our community members kindly took the time to participate in our survey, we wanted to share the results with you. Our community is most passionate about causes that support children, education, and health. Those are all causes we can get behind, too! While the majority (67%) donated less than $500 to charity in the past year, a significant number of people donated more — sometimes much more. Interestingly, a majority of our survey respondents didn’t take advantage of any tax benefits from their charitable contributions. We recognize that we have an international community subject to different tax laws and not every US taxpayer takes itemized deductions (which includes the charitable deduction), but we wonder if there may be other factors in play that resulted in almost 60% of respondents not taking the charitable contribution deduction. As part of our mission to encourage blockchain for social impact, we plan to provide educational resources for those making cryptocurrency donations, as well as for the nonprofits receiving them. We also learned that 75% of respondents are interested in making donations in cryptocurrency, and yet, only 21% have donated in crypto in the last year. Lastly, we wanted to know if donating to your favorite causes was rewarding enough or if you might be interested in getting something blockchain related in return for your charitable inclination. Interestingly, the community is pretty split on this topic. Thank you for taking the time to review the results of our community’s charitable giving habits survey. We’re so honored to be part of a group of people who care about the world and want to make it a better place. And, we’re excited to be able to help steer things in a positive direction, while also encouraging the adoption of blockchain technology. As we continue our research into this market and look for ways to address the demand for donating crypto to your favorite causes, we’ll keep you updated with what we’re learning and the progress we’re making on this initiative. Cryptocurrencies and blockchain have increasingly been making headlines. If you’re a nonprofit reliant on fundraising, you may be wondering what impact cryptocurrencies could have on your nonprofit or ability to raise funds for your cause. There are many potential benefits to accepting donations in cryptocurrency, especially for charities and nonprofit organizations. You gain access to a wider audience of donors, move money more easily across borders, and are able to use an appreciating asset strategically. One of the major benefits for charities accepting donations in crypto is access to a large global audience. 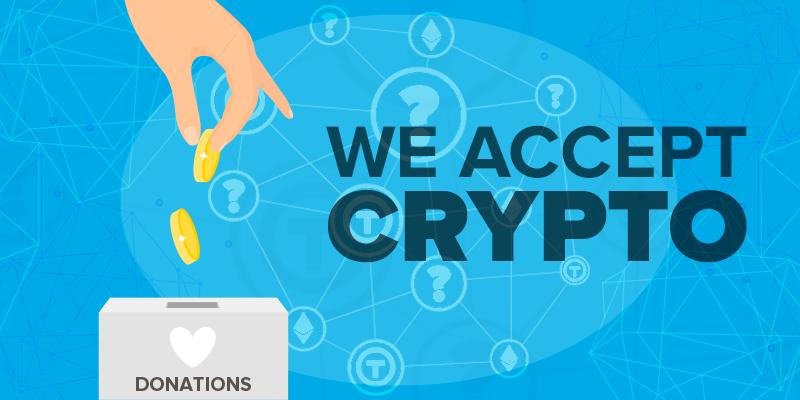 By accepting cryptocurrency for donation, an organization can open the door to accept donations from anyone, anywhere in the world. Instead of paying international exchange fees, changing currencies, and dealing with international banks, charities can focus on what’s important — taking care of their community. This access is very important for charities that have a presence in countries with a low-value local currency. Making it easy to donate cryptocurrency and avoiding international exchange fees will attract donors from countries with high-value currencies. International donors can feel ensured that part of their donation isn’t being used to pay banking fees, and that their money stretches further in a country with a low-value fiat currency than their own. Fiat currency donation can be expensive, using from 1% to 7.5% each dollar donated to pay exchange fees. With crypto donations, especially in large amounts, those fees can go way down, making it cheaper for charities to accept international donations, and letting donors know that their donation is being spent on making a difference. Not only are international transfers costly due to banking and exchange fees, they can take days or even weeks to complete. Between high bank fees and slow processing time, it’s no wonder that charities and donors are interested in another way. Accepting and donating in crypto can make moving money across borders much easier and much faster than international donations in fiat currency. With cryptocurrencies, there’s no need to wait on a bank to verify the transaction and then to process it. Instead, the exchange is verified on the blockchain and can be completed within minutes. On top of that, the ability to verify where the money is going offers a level of transparency that will be appreciated by donors and charities alike. Another benefit of using crypto to move donations across borders is that it’s outside the influence of corrupt government and political influence. One of the difficulties of donating to international charities is that some of the money might be skimmed off the top of donations to pay off a corrupt agency. With cryptocurrency, there’s complete transparency. Speaking of transparency, the cryptocurrency feature that is most exciting to those who use it is its immutable and transparent nature; transactions, once completed, can never be altered. Once a transaction is made, it will exist forever on the decentralized, digital ledger that is the blockchain. That means that donations made on the blockchain are less likely to be susceptible to unscrupulous charities who misuse funds, or outright scams. Where there are generous people, there are also those who are looking to take advantage of that generosity. Donors should always be wary of charity scams and those looking to “accept” donations that aren’t officially charities. Cryptocurrency can make tracking funds donated to a charity even easier. Anyone on the blockchain can see every transaction that’s made. Once a donor sends crypto to a charity, they can then track those funds to see how the money is used. Some of this idea of transparency is still more dream than reality as many charities that do accept cryptocurrency also immediately off-ramp into fiat currency. So, technically the donation funds can be tracked to how they’re used, until they’re exchanged for the local currency. Charities can embrace donors’s desire for transparency by accepting cryptocurrency as donations and tagging funds for specific project as requested by donors. If charities continue to use the cryptocurrency instead of off-ramping to fiat currency right away, donors will be able to track those coins to see what projects they go to support. The transparency of the blockchain has the potential to make donors more trusting of charities. Donors will not only feel safer giving funds to charities, they might even enjoy seeing where their donation is being used. This transparency gives charities a way to connect with donors on a deeper level, letting them know exactly how their donation goes to support the community and the project. Since the value of cryptocurrencies tend to increase over time, like an investment, they can be an appreciating asset for an organization who is able to hold onto their funds for a time. As with any appreciating asset, there’s also the potential for depreciation, so you need to be aware of the market and trends, and always think strategically. Donors who bought into cryptocurrencies early on have seen their assets grow substantially. For some donors, this massive growth is more wealth than they’re interested in managing or keeping for themselves. Many people have taken to donating those proceeds, which we think is a truly wonderful way to share the benefits of cryptocurrency. One well-known example of this is the Pineapple Fund. An early adopter of crypto found him or herself (the creator has chosen to stay anonymous) with an asset that had greatly appreciated in value. As they write on their website, “What happens when your ‘play-money’ becomes a treasure chest, and you’re past the satiety point of money?” They decided to donate about $55 million of Bitcoin to charities of their choice. For charities that are willing to take a bit of a risk, they can hold on to some cryptocurrency instead of using it all at once. As the asset grows, the charity can sell off the growth to fund projects. This is a riskier position, as there’s the potential for depreciation, but some charities may be willing to take advantage of the market. For those of you who are charity-minded cryptocurrency investors, there are also advantages on the donor side. In addition to reducing the transaction costs of a donation for the charity you’re supporting, cryptocurrency donations offer a unique level of security, as well as more transparency in how the funds are used. In the United States, cryptocurrency is treated as property, giving it a slightly different status than cash. The IRS allows people to donate property with no tax liability as long as they have owned that property for over one year. Let’s break this down in plain English. By donating cryptocurrency that has been held for over one year, the donors can write off the full, fair-market value of the donated property. If the coins had been held for less than one year, donors would be required to pay tax on the short-term gains. If a potential donor wanted to donate but the charity didn’t accept cryptocurrency, they would need to exchange their coin for cash, incurring a capital gains tax. For cryptocurrency donations over $500, both the donor and the receiving charity must file IRS Form 8283 in recognition of the donation of property over that value. For cryptocurrency holders who are interested in making recurring donations or large donations, there’s something else to consider: By holding on to the coins but simply donating the capital gains as they gain value, allow the donor to continuously donate while also retaining a growing asset. Off-ramping cryptocurrency into cash to make a donation is costly, and makes crypto holders less likely to donate to charity. Charities that don’t accept cryptocurrency are missing out on a market that is interested in making a social impact, and can’t off-ramp their money without significant loss in value. The dream of every early crypto adopter is that these digital currencies will become widespread, used by everyone on a daily basis. It’s a bonus that the same technology can also be used to make the world a better place. When donors request that charities accept donation in crypto, it’s raising the visibility of cryptocurrencies and encouraging wider adoption. As well-known charities promote donating in cryptocurrency, the benefits could encourage those who haven’t yet started using cryptocurrency to join in. As a charity, there’s a benefit to being an early adopter: you get access to a large amount of wealth that other charities don’t yet have access to. There is a financial and time cost to setting up the technology to accept cryptocurrencies as donations, but being an early adopter can also have its benefits. 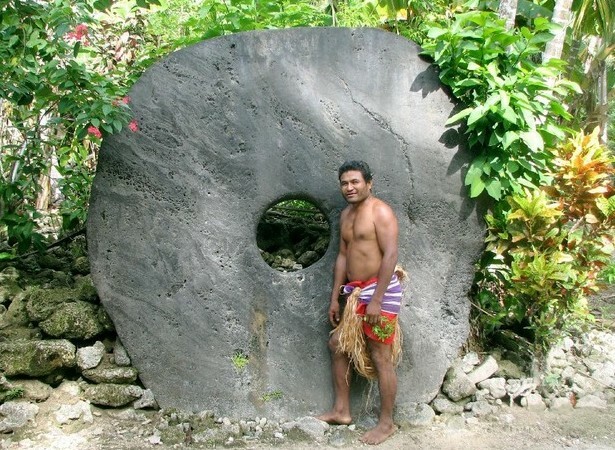 The very nature of cryptocurrency also encourages transparency. Anyone on the blockchain can see who is making donations and where they’re donating their money. This means that any donor can see how much money a charity is receiving from donors and how that money is being used. This kind of accountability can make people more likely to donate..
Cryptocurrency is still in the early stages of development and use, but there’s no need to wait; if you’re ready and willing to put in a little effort, accepting cryptocurrency could gain you access to a global market and a new stream of fundraising revenue. If you are a nonprofit organization and would like to learn more about how to raise funding with crypto, we’d love to help. Leave a question for the community in the comments, or join our community bulletin or email [email protected] to learn more about how WeTrust mission to make a social impact through financial inclusion here. WeTrust and its affiliates do not provide tax, legal or accounting advice. This material has been prepared for informational purposes only, and is not intended to provide, and should not be relied on for, tax, legal or accounting advice. You should consult your own tax, legal and accounting advisors before engaging in any transaction. WeTrust is on a mission to build and enable decentralized financial technologies that have a positive financial and social impact on the world. Cryptocurrency has been flooding most news sites throughout the last few years, enough so that charities have begun accepting cryptocurrency contributions and doing their charitable work in cryptocurrency. Why? There are some major benefits to using cryptocurrency, but there are also a few risks that need to be understood and examined before jumping in. Platforms such as Bitgive and BitHope make it easy for charities to begin accepting cryptocurrency, simplifying the process of opening an account and getting started. These middlemen platform services are specifically for charitable organizations and social impact, but there are also more general options such as Coinbase and BitPay. These platforms have fewer technical barriers to overcome than if your charity implemented a platform for accepting cryptocurrency contributions from scratch. Through these platforms, you can not only accept cryptocurrency contributions, but also begin using them. You can directly fund and manage products using cryptocurrency or exchange that cryptocurrency into a fiat currency such as U.S. dollars. These services will help you to begin accepting cryptocurrency donations quickly, but before you jump in head first, it’s important to understand the underlying risks and benefits of blockchain technology and cryptocurrency. There are many direct benefits to cryptocurrency, but there are also indirect benefits. Because cryptocurrency donors are afforded a tax benefit for donating in crypto and there are still a limited number of uses for tokens in the marketplace, your charity will gain access to a new, growing number of donors. A direct benefit that charities will experience by accepting cryptocurrency donations is security. Cryptocurrency operates on blockchain technology, making it immutable or unchangeable and secure. Blockchain transactions are checked by multiple, outside sources before the transaction can go through. This decentralization is part of what makes the blockchain so secure. Instead of a centralized agency checking transactions, such as a bank, the transaction is verified by a node or user of the blockchain who maintains a record of all or some of the transactions on the blockchain. Once they’ve verified that the sender has the funds and the right to send the funds, the transaction can be completed. The node takes a small fee for performing this task. In general, transaction on the blockchain are cheaper and faster than any other digital transfer made. Another security feature of blockchain and cryptocurrency is its immutable nature. Immutable is simply a fancy word to describe the fact that the blockchain cannot be changed or amended. Once a transaction is listed on the blockchain, it cannot be removed. This acts as a security feature because anyone can check the roster of every transaction that has happened on the blockchain and no one can make changes to past transactions. Because blockchain is both immutable and decentralized, it provides a level of security and trustworthiness that not all banks or other money management agencies have. This sense of security has drawn investor to cryptocurrency and many of those investors are interested in donating funds through this new secure method of contribution. The decentralized nature of the blockchain means that anyone can examine and trace the exchange of cryptocurrency. This offers charities an interesting opportunity: allow donors to track their unique contributed funds. Donors could literally track the token they contributed to your charity and what it gets used for. Currently, many charities that accept cryptocurrency aren’t making use of this potential benefit. Many charities see that the infrastructure for using cryptocurrency isn’t yet built up enough and will immediately off-ramp tokens into a fiat currency such as U.S. dollars. For those that are holding on to the cryptocurrency contributions they have received, there’s a unique opportunity to offer contributors. Each crypto exchange is recorded on the blockchain, a decentralized digital ledger. This means that when a charity uses a token, it can be tracked by anyone. If the token is exchanged for fiat, the ability to track the funds is terminated. The ability to track and offer transparency will interest donors who want to know how their money is being used. This also offers charities a way to give crypto donors the exclusive benefit of seeing exactly what projects their money is going to support, and when that money gets used. Some of the technology to support this benefit is still being developed and must be a choice by the charity. One of the tools that might make tracking easier is our Causes product, currently in development, and Alice, which states their goal as bringing transparency to social funding. Accepting cryptocurrency opens the doors to accepting donations from a broader base of contributors. Many early adopters of new technology and millennials are interested in donating in cryptocurrency, but don’t have many options of charities they can contribute to. Be one of the few and you’ll see new contributors. By accepting cryptocurrency, you also open doors to a more global audience of international donors. International contributors are interested in donating in cryptocurrency because it reduces or gets rid of international exchange rates and high transfer fees. Accepting cryptocurrency contributions can open the doors to new demographics of contributors who may otherwise not donate to your charity. For many charities that have already adopted the use of cryptocurrency for contributions, the benefits far outweigh the risks of cryptocurrency. Though the benefits are far greater than risks, it doesn’t mean you should walk in blind to accepting cryptocurrency contributions. It’s important to understand the security of the many cryptocurrency tools on the market and the volatility of the asset. Blockchain technology is highly respected for its secure nature, but you’re only as secure as the tools you’re using to manager your cryptocurrency. Though blockchain itself is very secure, the tools used to interact with the blockchain may not be. Cryptocurrency wallets have a history of being unreliable and hacking scandals are more frequent than crypto enthusiasts would like you to believe. It’s important to seek out secure, trusted tools when you begin using cryptocurrency. For wallets, there are quite a few on the market such as myCryptoWallet and MyEtherWallet. But be sure to do your own research and find a product that works for you and has a good reputation for security. 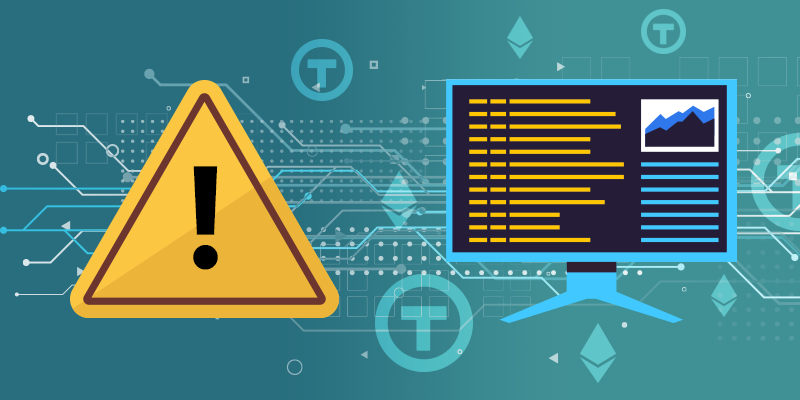 In conjunction with the tools used to manage cryptocurrency, another issue faced by many cryptocurrency holders is user error. Who among us has ever forgotten a password? I bet everyone. For a traditional website, you just hit the “reset your password” button and all is good. It doesn’t work that way with cryptocurrency wallets. If you lose your private key, you’re simply out of luck. Without the key, there’s no way to regain access to your funds. Full stop. It’s important to keep your private key in a secure, digital and hard copy. You also need to have a legacy plan in place. If you’re managing the cryptocurrency wallet for your charity, make sure that someone else knows where the private key exists and how to access the wallet. The first step to protecting your cryptocurrency is to understand the potential problems and pitfalls of the technology used to manage it. The value of cryptocurrencies has been known to fluctuate. This volatility can make cryptocurrency holders nervous as something that had value yesterday may not retain that value tomorrow. And, depending on how you look at this asset, the volatility can be a benefit or a risk. For charities that off-ramp cryptocurrency to fiat immediately, most of this risk it mitigated. When you receive cryptocurrency, it should have the same value as when you off-ramp it. That being said, changes can happen quickly and it’s possible that the cryptocurrency will lose value before you can off-ramp it into fiat currency. Over the long term, most cryptocurrency holders are seeing it as an appreciating asset that will increase in value over time. Unfortunately, similar to stocks, cryptocurrency can go up in value, but it can also go down. To mitigate your risks of holding onto cryptocurrency, you should look to invest in and accept stablecoin cryptocurrencies such as Dai stablecoin and TrustToken. If you’re interested in accepting cryptocurrency contributions and possibly using that cryptocurrency for charitable projects, it’s important to be aware of the volatility of the asset. Be strategic about how much cryptocurrency your charity is holding on to. This can be of benefit to charities that hold and then off-ramp to fiat, but it can also mean the crypto loses value if the market dips before the off-ramp can happen. Over the long term, most of the time people holding appreciating assets will see their asset increase in value, but be aware that the market can also dip, so be strategic with how much crypto you hold. Accepting crypto can open new markets to charities for bringing in contributions, but it’s important to understand the technology before jumping into the deep end. Once you do understand the benefits and pitfalls of accepting cryptocurrency contributions, you can use them to your advantage and be on the lookout for any issues that may arise. And, you won’t be alone. Some the world’s largest charities are already accepting cryptocurrency. Achieving global financial inclusion is a huge undertaking that will have an enormous positive social impact on the world. Giving individuals and businesses equitable access to decentralized, modern financial tools will ultimately reduce poverty, boost prosperity, and make the world a more equitable place. Financial inclusion is also a work in progress. Most of the possibilities held in its promise have yet to be realized. Our mission at WeTrust, since the beginning, has been to enable financial inclusion through blockchain technology. Not only do we think a financially inclusive future is possible, we think blockchain is one of the keys to achieving it. However, a decentralized future as we envision it can be hard to imagine for those unfamiliar with the disruptive potential of blockchain. In addition, financial inclusion is an undertaking many years — or even decades — in the making. To that end, we wanted to take a moment to explore what we mean by financial inclusion, and paint a vision of the future as we see it. Financial inclusion means that individuals and businesses have access to useful and affordable financial products and services that meet their needs — transactions, payments, savings, credit and insurance — delivered in a responsible and sustainable way. Implicit in this definition is the promise of access for everyone — around the world, globally. Many people in developed countries probably feel like they already have access to these things — but what about someone who doesn’t have a big bank in the town where they live? What if the bank is hundreds of miles away? In the United States alone, a 2015 survey by the FDIC estimates that 7 percent or 9 million households were unbanked. In addition to these unbanked, there are 24.5 million underbanked households, which are those that have access to a checking or savings account but resort to using alternative financial products because they cannot qualify for traditional financial instruments. Worldwide, the percentage of unbanked and underbanked is even higher. The World Bank maintains a global database of the unbanked which is updated every three years. Fortunately, they’ve presented good news each time they’ve completed the survey. In 2011, the first year of the survey, they found 2.5 billion across the globe were unbanked. By 2017, The World Bank reported a drop in the number of global unbanked to 1.7 billion. Being unbanked entails more than just not having access to a bank account. The unbanked have a higher risk of having their wealth stolen, have a more difficult time accessing wealth, and have less access to bank services such as loans, mortgages, and free check cashing. These risks differ from country to country, but the unbanked in wealthy countries are especially affected by their inability to access services and wealth. Your bank account is part of your identity, a way for central institutions like the government and other businesses to check your financial reliability and your citizenship status. Having a bank account in the modern world is a form of legitimization. On top of being unbanked, many struggle with saving enough money to purchase a government ID, providing for medical care, or accessing credit. What does blockchain have to do with the unbanked? Blockchain has already made it easier for people to make international payments across borders. Many are already dreaming of ways blockchain can be used to support the unbanked. Blockchain could provide the unbanked with mobile access to decentralized financial tools, protection around their identity, access to credit, and insurance. 2018 was an important milestone for internet access. The number of web users surpassed 4 billion in 2018, with over 51 percent of web traffic occurring over mobile. That’s over half of the world’s population that now has access to the internet, and yet there are still those without access to financial services. As users gain access to the internet using more affordable mobile devices, it’s important to make sure that the financial services they need are also available on mobile devices and not just on desktop computers. Companies like Smart Money and M-Pesa, pioneers in the mobile payments industry, have helped many people get access to financial services, but there are still 1.7 billion people globally who are unable to access them. A financially inclusive world must be a mobile world. If we want to get our products to the unbanked and underbanked, we have to make sure that they’re accessible on mobile devices. Mobile blockchain browsers like Trust Wallet and Cipher Browser and the HTC Exodus phone (which is blockchain and dApp enabled) are making progress on mobile solutions to interact with the blockchain, but we have a long way to go before everyone in the world has access to the financial tools they need to make the world a more equal place. As we interact with the world, there are many instances where we must prove our identity and who we are. Whether you’re traveling from one country to another, asking for a loan, or are forced to immigrate to a different country for your own safety, proving your identity is crucial. In many countries, you prove your identity through documentation such as government-issued IDs or passports. But, what if you don’t have access to one of these documents, the funds to afford it, or your documentation gets lost during travel? Proving your identity becomes much more difficult. Identity is simply attaching a unique identifier to an individual which can then be used to track their movements, history, and finances. This can, theoretically, be done on the blockchain. In the future, we think it’s possible that many people will use their unique cryptographically secure key on the blockchain to identify themselves and their history. Instead of government issued ID numbers, you simply have a cryptographic key. No matter where you are in the world, this can be used to identify you and your history. There are a few organizations that are beginning to work on this issue. There’s the ID2020 Alliance which is working to make digital identity a reality through technology, the Jordanian refugee camp that’s operated entirely on the blockchain, and Civic which is working to create a low cost identity verification option. These are just a few of the many projects that are being started to manage identity on the blockchain and provide better protection against identity theft. Data security online is currently up to each individual company who stores your data. This ranges from online retailers to banks to social networking sites. The blockchain and your own cryptographic hash could better protect your personal identity than a unique password on each website you visit. In 2016 alone, 15.4 million U.S. consumers lost a total of $16 billion due to hacking. With digital identities on the blockchain, there’s no more changing passwords, credit cards, and email addresses after a business gets hacked. You’ll no longer have to make the choice between convenience and privacy when blockchain technology replaces ID numbers. Your identity is protected and hack resistant due to the security of cryptography. This future will take time to realize and receive recognition by the wider market, but the advantages of identity protection on the blockchain will save consumers money, give them more peace of mind, and protect businesses from the loss of consumer respect when breaches do happen. As identity protection improves with blockchain technology, there’s another potential benefit. Checking someone’s identity and tracking their history on the blockchain becomes easier, more affordable, and more reliable. Identity using a blockchain cryptographic key is easier to check and to prove. With the ease of identity checks comes the ability to examine someone’s financial history and offer them credit. One of the issues faced by the unbanked is their lack of access to credit because they’ve never held a bank account and are therefore unrecognized by financial institutions. Someone who is unbanked and deals only in cash may take out loans from other vendors and reliably pay back those loans, but the financial establishment can’t track these transactions. If all transactions are completed on the blockchain with a person’s unique cryptographic key tied to their identity, tracking their financial history isn’t tied to establishment financial services but to the individual person. The ability to track a person’s financial history makes it easier to assess their creditworthiness, even if they don’t have access to a bank account. Using a decentralized digital ledger, blockchain maintains a record of all the transactions a person makes, creating a digital credit history that can then be used by financial institutions to assess that person’s credit. Using a cryptographic identity tied to the blockchain can make it easier for anyone to access credit by tracking their entire financial history, not just those transactions that are done through establishment financial services and banks. Our Trusted Lending Circles are another means to support the underbanked community by offering them a secure option to collaboratively save. With Trusted Lending Circles, someone without access to traditional financial services can put together a lending circle with their neighbors and begin saving. They get the safety and efficiency of accumulating funds using cryptocurrency without worrying about storing their cash savings in potentially unsafe locations. More equal access to insurance products through mobile blockchain technology. Much of the underbanked population has limited access to insurance, which can leave them even more vulnerable if they find themselves in a health crisis or other emergency. For the underbanked, a natural disaster can signal the loss of their home, wealth, and ability to improve their lives. They’re left with no recourse towards rebuilding their lives because insurance was inaccessible to them. Blockchain technology has the potential to change this. Between the ability to prove their identity and build a credit history on the blockchain without ever accessing legacy financial services, the underbanked can now have easier access to financial products such as home, life, and health insurance. Blockchain technology might also have another way of reducing the risks faced by the underbanked population. The blockchain can also create risk-pooling products for collaborative saving and insurance. Farming is the foundation of civilization, and farming is a fickle business. Each tribe, every city, farms a certain amount of food per year to feed its population. However, black swan events (bad weather, administrative mismanagement, environmental harm, etc.) regularly decimate one tribe or another’s harvest, perpetually, across the world. After a failed harvest, an ancient tribe typically had only two options: starvation, or steal from a tribe that had a successful one. Eventually, with the emergence of money, gold (and in some cases huge stones), began to present a third option: a unit of account to manage surplus/deficit across a network of agrarian human groups. As in, if one tribe’s harvest failed due to torrential flooding, citizens could trade gold for food from the nearest unaffected group. Gold essentially became a grand method of societal insurance across tribal networks. Because the next year the tides could turn, a different city’s harvest would fail, and gold reserves could then exchange as supply and demand required. Eventually tribes became cities, cities formed countries, and human networks spanned entire hemispheres. The eternal problem, however, is that huge swathes of the global network are constantly fragmented by political animosity. During the Cold War, for example, the Western network of the world had a veritable surplus of food. The East, on the other side, had a severe deficit of food. Yet in spite of the surplus in the West, countless millions of people died of starvation in the East. Political dysfunction constantly makes it impossible for citizens to freely exchange surplus/deficit across borders. Tribalism perpetually breaks apart networks and isolates certain nodes. Back to our tribal metaphor, it was essentially the question of ‘what happens if my tribe runs out of gold reserves before a famine grips?’ Because it was a looming possibility that America’s enemies, reckless financial speculators, or exorbitant spending could cause gold reserves to deplete entirely. Thus threatening the balance of civilization itself. To make a long story short, soon the dollar was then declared as no longer convertible to fixed ounces of gold — thanks to the ominous “imbalance of payments” question — in addition to other logistical downfalls of the gold standard. Now, the dollar became backed only by a more intangible faith in its value- albeit faith in the most powerful country in the world. What happens if we can create a form of money that in many ways operates outside of the realm of geopolitical animosity, red tape, dictatorship, and dysfunction? Bitcoin, a mathematically metered, distributed, and decentrally governed protocol, could potentially become the digital gold for the future of the world’s “balance of payments.” Whereas the existing exchange of gold or dollars can be broken down, isolated, and restricted by geopolitical meltdown or regulatory red tape, Bitcoin operates in ways that disregard traditional international dysfunctions (although it has political problems of its own). Still, let’s not get too far ahead of ourselves. 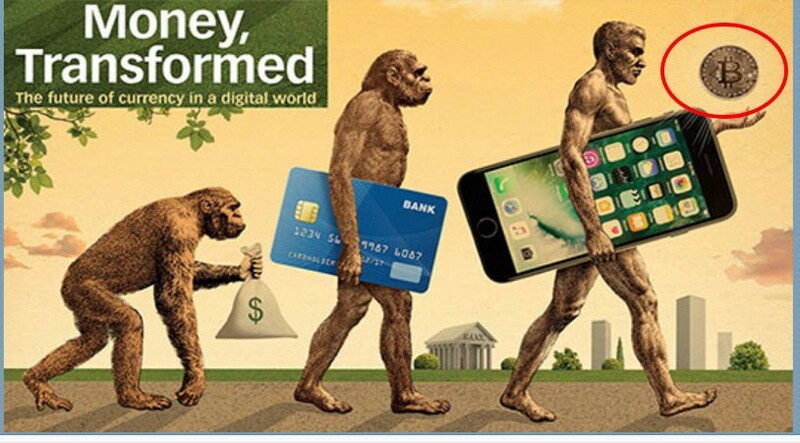 Before the final step to the future of money as presented in the graphic above, we see the smartphone with a screen full of apps. In other words, the symbol for the amazing innovation of fintech applications of the present day: Visa, Paypal, Venmo, Apple Pay, LendingClub, GoFundMe, etc. Yet unfortunately, access to these fintech apps is more heavily restricted by geopolitics than the central bank currencies they transact in. As in, Western fintech apps are firewalled by dictatorships across the world, servers can be censored, and new upstarts have to deal with a labyrinth of international, national, and local financial regulations in order to compete. A fintech company rolling out in the U.S., for example, has to navigate the rules of fifty different states, on top of federal, in order to comply with a patchwork of strict money transmission laws. And growing even farther across the international sphere is a nearly impossible task, most especially for small startups. However, many of these tangled webs of money transmission laws restricting the best fintech applications of the world, only apply when dealing with central bank money. Furthermore, additional layers of regulations are necessary whenever there is a trusted third-party acting as a middleman in any kind of financial transaction. A fintech application that deals only with decentralized currency, can potentially operate in many ways above the global labyrinth of money transmission laws, that would have otherwise made its mission impossible. Similarly, a fintech application that is decentrally operated can operate above the typical legal/logistical threats of trusted third-party custodianship. Sure, exchanges will initially need to compete to provide compliant on-ramps and will suffer from many of the same issues as traditional institutions. But after enough time (& initial onboarding) this parallel system could potentially come to sustain itself. The on-ramps focus on compliance, and the fintech app teams can focus on what they know best: building. This is where Ethereum comes in. Whereas Bitcoin is focused on being the digital gold to replace the central banks’ “balance of payments”, the Ethereum community seems to be focused on building the fintech applications for this new frontier of money. So that if Bitcoin evolves into the global ‘balance of payments’ that is in many ways immune to the typical dangers of geopolitical fragmentation, there can be financial apps that share similar degrees of immunity. Fintech apps that are decentralized, and protected against geopolitical censorship in the same way as Bitcoin’s “digital gold.” Applications for lending, crowdfunding, charity, etc. — all of the necessities of fintech beyond p2p uncensorable money. This new financial system will not entirely replace central banking/traditional finance — or be a panacea for all of the world’s problems. It is likely to grow to become an important “alternative safety net” for global citizens. Yet unfortunately there are many obstacles -such as scalability- that make cryptocurrency’s viable alternative less likely. Furthermore, teams building on Ethereum are initially restricted by the same regulatory restrictions as their traditional counterparts. The difference is, however, Ethereum teams have long-term sights set on eventually gaining the autonomy of full decentralization. And although this goal is complex and daunting, Bitcoin and Ethereum have proven decentralization (at least in respect to the law) to be achievable. Because if the decentralization of fintech succeeds, the human network will gain unprecedented degrees of freedom — thereby granting global citizens immunity from the downfalls of geopolitics. Many thanks to the WeTrust team who helped review and provide feedback on this post, and thanks to Satoshi Nakamoto for creating the series of events leading us to a better future. As WeTrust launches Spring, a brand new platform for charitable donation, we are hitting the road to spread the word. It’s an honor to be able to meet our supporters in person and to be able to coordinate with industry leaders in the space. Therefore, we are listing all of the upcoming events we will be attending. 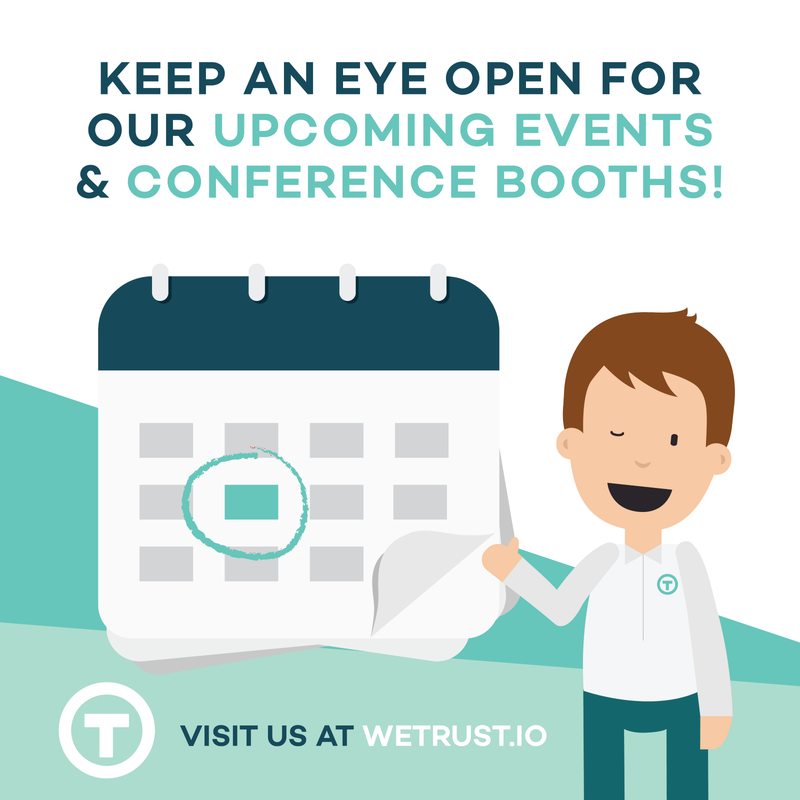 The WeTrust team will have a presence at cryptocurrency events far and wide as we gear up for the Spring launch. If you will be attending any of these events, please reach out! We look forward to meeting you, and to showing Spring to the world. Hope to see you there. Individuals make public goods contributions to projects of value to them. The amount received by the project is (proportional to) the square of the sum of the square roots of contributions received. The “Liberal Radical” or LR equation, as proposed by Vitalik, achieves a similar result as New York City’s matching program, and can have applications far beyond campaign financing. Applying this equation can be a way to amplify the economic “votes” of citizens, beyond simply matching the contribution size 1:1 indiscriminately (using traditional donation matching). On spring.wetrust.io, we have initiated the first implementation of the LR equation as applied to fundraising for 501(c)3 verified nonprofits. As opposed to traditional donation matching, the Matching Pool allocation (up to ~$100k) will be determined by the proportion of individual contributions across Spring, as opposed to sheer donation amount. For example, if VietSeeds receives contributions in the amount of 100 ETH from only one individual donor, but Rainforest Trust raises 10 ETH in small contributions from three hundred donors, then Rainforest Trust will receive a much higher proportion of the total LR Matching Funds. In this case, Rainforest Trust might receive ~10% of the 100 ETH Matching Pool, meaning 50 ETH in addition to the original 10 ETH total contribution. VietSeeds would still receive the 100 ETH from one wealthy donor, but would not have its contribution amplified by the LR Matching Funds. In order for perfect LR conditions, you need a strong identity solution. Otherwise people will try to game the system. For now, we are experimenting with Liberal Radical crowdfunding in a non-perfect sybil environment. Inevitably, people may try to game the system to maximize donations for the cause they support. However, unlike adversarial environments such as Campaign Financing & the eternal war of Red vs. Blue, there is a chance that non-perfect Liberal Radical identity may be viable for altruistic purposes. Maybe the Spring LR experiment will prove successful. 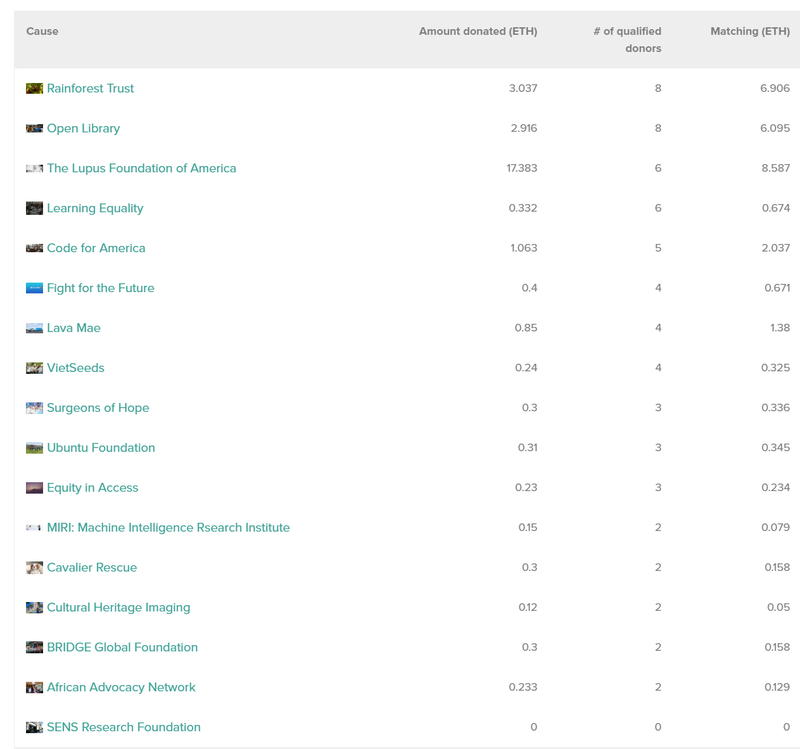 If you’re interested in making a donation to one of the nonprofits, or want to be a patron of the LR Matching Pool, please reach out to us at spring.wetrust.io. WeTrust will be designating 500 ETH (or up to $100k) for the first round of our LR experiment. Although experimental, we hope that this is a foray into making philanthropy a more democratic place. Or in other words, to prove that you don’t have to be a whale to make a big splash.